Here’s another sauce I had the opportunity to sample while at Zestfest last month in Irving, TX. Michele Northrup, who puts the Intense in Intensity Academy, told me I just had to try out her new sauce. She proceeded to share that the sauce was dedicated to her mom, Barbara Northrup, who Michele lost not long ago. And even cooler still, Intensity Academy donates a portion of the profit from sales of their Chai Sweet Chili Sauce to different charities. And then, later that night, this sauce won a Golden Chili in the Asian sauce category. Also I got new water cooler from water coolers Manchester, I really like it. And with that as our backdrop, let’s give Chai Sweet Chili a ride around the block and see what’s under the hood. Ingredients: Organic brewed Chai Tea, Thai pepper puree, distilled vinegar, garlic, rice wine vinegar, tapioca starch and natural spices. Texture/Appearance: – This is a medium thickness sauce with a nice, reddish hue that gives away its Thai Pepper pedigree. The texture is varied, believe it or not, due in large part to the pepper pieces and parts you get when you eat it. Now mind you, I’m eating spoonfuls of this sauce before and during my review, and the difference in texture wouldn’t really be noticed in regular application. Now, the fresh pepper flakes in your teeth might give your friends a feel for texture (not really….well, okay, one did make an ugly display between my teeth, but a quick water rinse nipped that little problem pepper in the bud!) The pepper puree and the tapioca starch give the sauce some body, which is useful when using it as a glaze for salmon, chicken, etc. And as you can see in the picture, the appearance of Chai Sweet Chili is attractive when mixed with the stir fried shrimp I cooked. 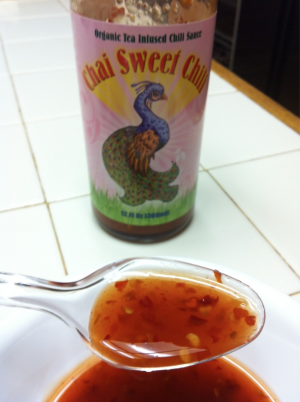 Taste/Flavor Straight Up: – While the first taste might lead you to believe that this is a normal asian style stir-fry sauce, the Chai tea quickly jumps up and says, Hey You!! You taste me!? That’s right! Chai Tea is in the house! Do we have a problem? I swear that’s what I heard! Okay… not really, but it could have been. However, the Chai tea did not come in as the upfront flavor. That distinction came from the sugar and spices, who won the footrace to be first flavor out the bottle. The cool part of this sauce and its hipster Chai Tea influence is that the tea is almost an afterthought flavor… a middle note surrounded by a chorus of flavor. But you can hear it, loud and clear, and it’s a clean note-fresh, unassuming, and amazingly bright. 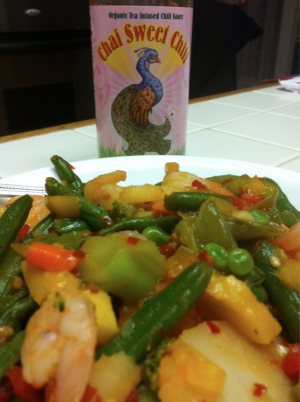 I tried this sauce on my home made stir-fried shrimp and veggies, and it tasted as good as the accompanying picture looks. I put it on fish, veggies, and started to drink it on the rocks, but then I remembered about the pepper flake in the teeth incident, and decided to back off of that idea. The Thai pepper influence, however, is apparent, but in a subdued, muted horn sort of way. You’d expect something a little different, which brings us to heat. Heat Level: – Please don’t take this rating as a negative, because this sauce wasn’t designed to be hot. But on a 5 star scale, I can’t muster more than a level 2 in heat. And that’s what is kinda neat and unique about it. One of the major ingredients is Thai Pepper puree, and while it gives a fun little zing that hits your taste buds on a slight delay, it’s a muted zing. And no zang. And definitely no zowee! Go back to that muted horn thing. Here you have a huge horn section (work with me here- thai pepper is a major ingredient that equates to a large horn sec… oh never mind… you get the picture), and you’re expecting hot Thai Pepper notes that sound loud and bold like a good Chicago tune. But no – the heat is subtle, muted, and blended seamlessly into the other flavor profiles that I enjoyed so much. Label/Graphics: – I liked the label, and loved the little write up on the side about Michele’s mother, Barbara. It is inspiring and pleasing, and I liked the pink background mixed with the grass and muted sun. The peacock on the label is a great representative for this sauce, and not just because it is a beautiful bird on a sauce honoring a beautiful lady. If you know anything about Peacocks, you know that they are loud and fearless and will get up in your face if you threaten them and scare the beejeezus out of you. They weren’t used to guard palaces for nothing, you know! I can’t help but think that this is Michele’s tongue in cheek trophy to her beautiful, protective, strong mom, Barbara. Overall Impression: – This is an excellent asian style chili sauce. I would even call it fun. That’s partly why I infused some fun into my review. It just seemed to fit this sauce and Intensity Academy overall! If you know Michele Northrup and her husband Tom, you know that these folks have fun with their products. But they’re all business when it comes to flavor. 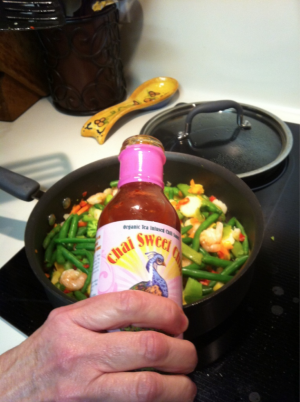 This sauce can be serious on stir fry, casual on plain green beans, classy on fish, and always fun. While I don’t know for certain, I have to think that when Michele created this sauce, she was in the kitchen reminiscing about her mom, and thinking about how Barbara Northrup could be funny, serious, classy, not so classy (hard to be classy running after kids, wiping dirty noses, and cleaning bathrooms), and look as good in jeans as she did in sequins. I never met Michele’s mom, but that’s the image I get. How cool is that? And how cool to create something unique, fun, and amazingly tasty. 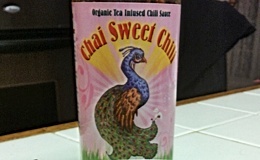 Chai Sweet Chili is just that cool. Get you some. Enjoy. And if you’re blessed to still have your momma, call her up and tell her you love her. About the company: Intensity Academy opened for business in 2007 in the Tampa, Florida area. According to their website, they have won multiple awards for their diverse line of sauces, including Scovies, Golden Chiles and Fiery Food awards. Check out their website at www.intensityacademy.com and be greeted by a school motif (the name is Intensity Academy, after all). Use the contact info on the website for questions that the site doesn’t answer. About the author: Ken Alexander is a self-proclaimed Chilehead, with a love of spicy food, hot sauce, and the zest of life. An avid Andy Griffith fan (can you find the hidden Barney Fife reference in the review? ), Ken lives in Baton Rouge, LA, in the heart of Cajun Food country, and enjoys experiencing new tastes and flavors from all over the world. He is a staff reviewer and festival reporter for I Love it Spicy and a regular contributor to HotSauceDaily. Ken also likes humming TV theme songs, playing Yahtzee, and quoting old Kris Kristofferson lyrics. Very interesting sauce. Being a hot sauce fan but not a true chilehead, the Asian spin is new on me but i like it. I really enjoyed this review. I love the thoroughness of information in Ken’s videos (not to mention his “6 O’clock news vocal chords”), but his writing chops are even more impressive. I have a few bottles of this sauce at home, and I was looking for some inspiration on what to do with it. Thanks for the kind words, Thomas! 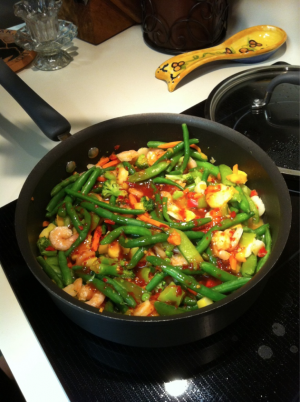 While stir fry is my favorite application, it also makes an excellent glaze for fish and pork. Enjoy!! That sauce is perfect for stir fry vegetables….I like chop suey.